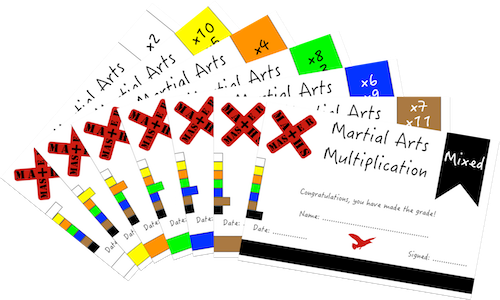 Children will be able to earn Martial Arts Multiplication awards once they have completed a series of challenges demonstrating their skills. These awards will be graded according to Martial Art style colour bands (linked to National Curriculum expectations). Children will be tested in school on each of the times tables (see order above). They will be given 1 minute to complete 13 questions. There will be 3 separate tests: forwards, backwards and random. On occasion, teachers may use additional activities to test understanding. Here is an example of how a typical test will look, using the 4 times tables. Note: These may also be presented in reverse i.e. 3 x 4 = OR 4 x 3 =. The children will be given blank grids that they will have time to prepare (see below). These can then be used for whichever times tables they are currently being tested on. You may download a copy to use at home – download here.